Since 1982, Crafted Plastics Inc. has met or exceeded the plastic extrusions needed by manufacturers and distributors worldwide. Crafted Plastics Inc. has years of experience producing high quality plastic extruded profile to customers’ stringent requirements. With a wide range of production capacities including co-extrusion, dual-durometer and tri-extrusion capabilities in a broad variety of colors (limited only by the color spectrum), Crafted Plastics Inc. can take virtually any customer concept and produce the custom plastic extrusions to client specifications. From the simplest to the most complex extruded plastic tubing or extruded profile, Crafted Plastics Inc. can manufacture quality custom extrusions on schedule and at a reasonable price every time. Crafted Plastics Inc. manufactures custom plastic extrusions in an extensive selection of plastic materials, including rigid PVC (polyvinyl chloride), polyurethane, ABS (acrylonitrile butadiene styrene), acrylic, styrene (high impact polystyrene), polycarbonate, polyethylene, PETG (polyethylene terephthalate glycol), polypropylene, flexible PVC, butyrate and thermoplastic elastomer. Industries that Crafted Plastics Inc. has manufactured custom extrusions for include construction, medical, point-of-purchase, refrigeration, commercial trucking, and water purification industries, to name a few. 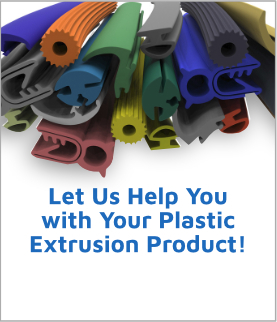 In designing the tool to manufacture the extruded plastic part, Crafted Plastics Inc. can work from a rough sketch as well as offer suggestions as to what plastic extrusion material would be ideal for the customer’s extruded plastic application. 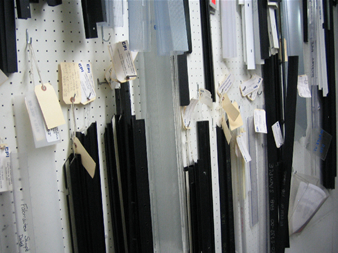 In addition to our standard materials, we also offer custom extrusion applications. ABS (Acrylonitrile Butadiene Styrene) Rigid plastic excellent impact. Brittle point - 40°, heat deflection 212°, good chemical resistance unless under stress. Acrylic - Rigid plastic excellent clarity, available in straight acrylic (can be brittle, but water clear clarity) or impact grades. Butyrate - Semi-rigid plastic excellent clarity, good with chemicals. Available with UV protection or FDA approvals. Flexible PVC: Flexible plastic available in 60 durameter shore "A" scale to 97 durameter shore "A" scale. Can be produced in clear, high gloss colors or matte colors - good cold temperature. Not good with certain chemicals, oils or fuels. PETG: (Polyethylene Terephthalate Glycol) Rigid plastic excellent clarity, good impact, not good with chemicals. Polycarbonate: Rigid plastic very clear and can be colored. Available in UV grades. Excellent low temperature and high temperatures. Low and high density Polyethylenes. Semi-rigid plastic - waxy feeling. Good in low temperatures. Good impact. Only opaque colors. Polypropylene: Semi-rigid plastic good cold impact and UV resistance. Only opaque colors. FDA approved. High Impact Polystyrene (HIPS): Rigid plastic. Inexpensive rigid plastic. Opaque colors only. Not very good with outdoor use. Polyurethane: Flexible plastic available in durometer ranges from 70 shore "A" scale to 95 shore "A" scale. Excellent chemical, oil and fuel-resistant. Low and high temperature use. Clean or Colored. Ester or Ether Base. High Impact Rigid PVC (polyvinyl Chloride) - Rigid plastic transparent, opaque or any color - high gloss or matte finish. Excellent chemical resistance. Good impact. Outdoor or interior grades. Most widely used extrusion grade material. Thermo Plastic Elastomers (TPE): Flexible Plastic excellent in low or high temperatures, excellent chemical resistance. Opaque colors only. Available in 60 to 80 durometer range - shore "A" scale. CP-3 (Propriators Blend) Rigid or flexible water clear or high gloss colors. Competes against PETG, Provista, Butyrate, Acrylic and Polycarbonate.